Main image courtesy Formula 1. 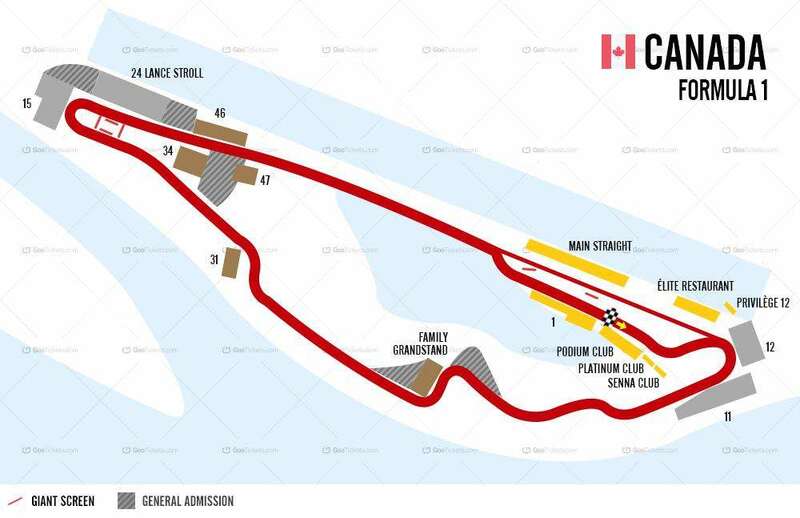 Where to watch the action at Circuit Gilles Villeneuve. 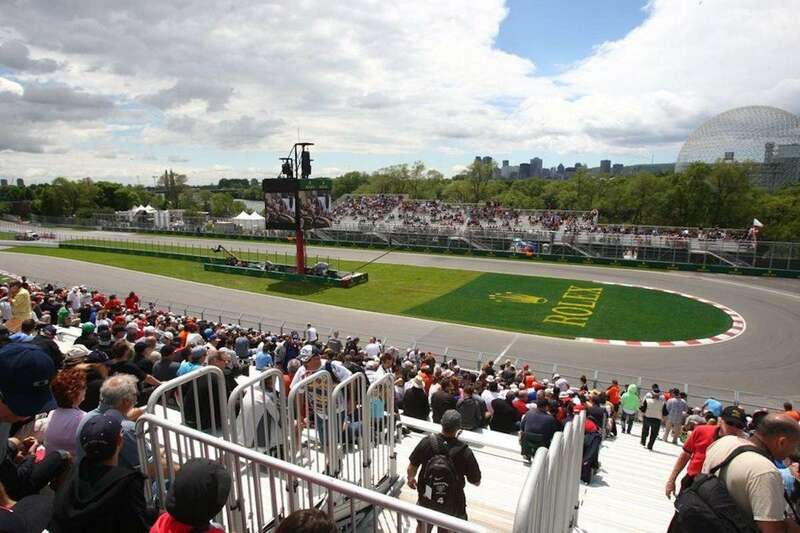 Your guide on buying tickets for the 2019 Canadian Formula 1 Grand Prix in Montreal on June 7-9. The Canadian Grand Prix remains popular, for good reason. The track is close to downtown Montreal, ticket prices are reasonable, the racing is often action-packed and the atmosphere is electric. Tickets for 2019 are now on sale with prices up slightly this year across the board, by an average of around $20-30. There’s also a new budget grandstand – 47 – on the inside of the circuit facing the Casino Straight, which offers single and 3-day tickets. Support the ongoing development and improvement of this site by buying your F1 tickets from our partners, Gootickets. We receive a small commission when you buy using the links on this page. We don’t apply any markup, so you’ll always pay the cheapest price! We also recommend Official Ticket Packages from F1 Experiences. *All tickets in this table offer 3-day entry to Circuit Gilles Villeneuve: Friday-Sunday. Grandstand 47 tickets cost $90 on Friday, $125 on Saturday and $175 on Sunday. Three-day tickets for Grandstand 47 are $200, and discounted children’s tickets are available. Official Ticket Packages for the 2019 Canadian Grand Prix are already available from F1® Experiences. From select grandstands to the Champions Club (next to the Wall of Champions) or Formula 1 Paddock Club™, all packages come with exclusive benefits unavailable anywhere else, including Guided Paddock Access and opportunities to meet current or legendary F1 drivers! All tickets are for three days (Friday-Sunday), though single day tickets are available for the new Grandstand 47 and General Admission, see below. Discounted tickets (approx 50% off) are available for children aged 11 and under who accompany a paying adult. The grandstands at Circuit Gilles Villeneuve are temporary structures with hard aluminum planks for seats, so bring along a cushion (the only exception is the most expensive Grandstand 1 seats on the pit straight, which have proper seats with backs). All grandstands have a large TV screen in front so you can follow the on-track action. Buy a grandstand seat if you can afford it; there is no elevation in the General Admission areas, so it’s hard to get a good spot to watch the action, especially on race day. 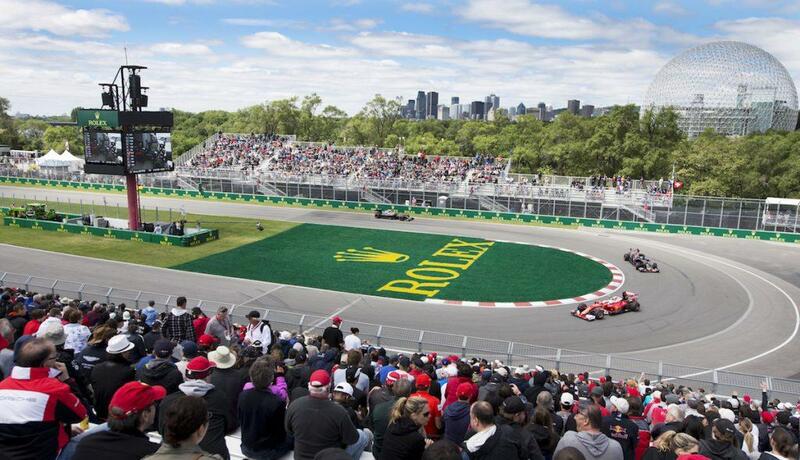 General admission tickets for the Canadian Grand Prix are cheap, but don’t offer the best viewing opportunities. The circuit is known for its long straights and slow corners, and grandstands take up the best viewing spots. This means that General Admission ticket holders either need to find a spot “packed like sardines” between the grandstands or watch the cars scream past on the straights. There is more room to move in General Admission on Friday, before bigger crowds turn up on the weekend for qualifying and the race. There are decent vantage points close to some grandstands, but you need to get there early to secure your spot. Either side of grandstand 24 is raised and fills up quickly. There is also space between and in front of Grandstands 11 & 12. The straight behind grandstand 31 provides shaded viewing, but doesn’t offer big screen viewing. Grandstand 1 is located on the main start/finish straight, opposite the pits. These seats are good for first timers and anyone who wants to watch the action in the pits, plus the race build up and podium celebrations. If you are after on-track action, choose seats in the opening Senna Chicane instead. The two grandstands at the Senna curve offer some of the best viewing opportunities at Circuit Gilles Villeneuve. There is always lots of action at this corner, particularly at the start of the race. If you get a good seat, you will be able to see the cars from the start finish line up until they disappear around turn 3. We recommend choosing a seat as close to the other grandstand as possible – low section numbers for Stand 11, high section numbers for Stand 12. This gives you the best view of the main straight while also providing a very good view down to turn 3. Both grandstands have two ticket categories this year, with a $30 difference. Go for the higher priced tickets for better views. The high section numbers in Grandstand 11 can have their views obstructed by the trees inside the Senna curve, so it’s better to choose a low section number in this stand. The low section numbers in Grandstand 12 can have views obstructed by the hospitality suites – if you choose a low section in Grandstand 12, get a high row seat so you will see all the action. The grandstands on the hairpin are a good choice and the ‘stadium atmosphere’ is awesome. Given the choice, we’d buy a seat in Grandstand 15, which gives the best front-on views of this important corner. Bonus at the end of the day: the hairpin grandstands are the closest to the metro station. Grandstand 15 faces the hairpin so all the action is in front of you and it is possible to see a long way down the entry and exit straights. It is however separated from the track by a gravel trap, so you are a bit further away from the action and noise. Grandstand 21 is closest of all to the metro station. Views from the lower rows, which are very close to the track, are limited by the new catch fencing. Higher rows in this stand have unobstructed views but are further from the track. Grandstand 24 will be known as the Lance Stroll Grandstand in 2018; everyone sitting in this grandstand will receive an exclusive cap and t-shirt to wear during the race. You are very close to the track in Grandstand 24 with a ringside seat of the cars accelerating out of the chicane. Food stalls and proper toilets are located right behind this grandstand. Grandstand 34 – located in the middle of the hairpin – is an affordable stand with good views. Get in quick as this grandstand always sells out first. Grandstand 46 (previously know as the “Popular grandstand”) is the worst positioned grandstand at Circuit Gilles Villeneuve, but also the cheapest. Single-day tickets are also available, unlike in most other grandstands. Views of the hairpin are obstructed by trees. For those who know the track, there is a small left kink after the hairpin. If there has been a lot of rain, there can be standing water in this area and it tends to catch out a lot of drivers, particularly in the support categories – the Popular Grandstand provides the best views of the action which can ensue. There is no big screen TV here. The Family Grandstand (previously Grandstand 33) is located on the outside of turn 6. We recommend seats in the lower section numbers, which give you a better view of the approach than higher section numbers. Grandstand 31 on turn 9 is set back a long way from the circuit proper , and you don’t get to see the cars for as long as at the Senna Chicane or the hairpin, but it is still decent value. Worth considering. Been to Circuit Gilles Villeneuve? Tell us your favorite place to watch the action! I want to buy 3 Senna trio tickets for the 3 days at the Canadian grand prix. Not seeing how to do that on your sight? I’ve been looking at tickets as three of us are going this year but only Sunday. We don’t want to do the popular grandstand. I’ve found multiple sites that are selling single day tickets for most grandstands. How is this possible? On the F1 website only three days passes are available for those grandstands. Hi Chris, I would be very careful about buying Sunday-only tickets for anything other than General Admission or the Popular Grandstands. They are not official and there is the chance you will not get what you pay for. From the Circuit website: “Tickets to the Event are strictly non transferable and not for resale.” The only exception would be for some corporate areas, where you can purchase single-day access. To avoid any hassles, I would just pay up for the full 3-day ticket to your chosen grandstand and purchase from a legitimate source; from the official seller (Admission.com/Ticketmaster) or from a reseller such as BookF1, Gootickets or GPTicketshop – see the links on our sidebar. 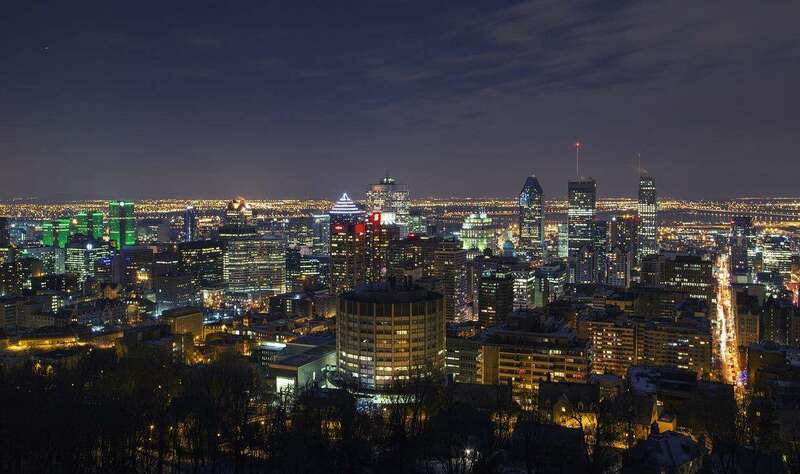 Enjoy the weekend in Montreal! Above it mentions picking a high section in grandstand 12. How do I know what the different sections are? Editor, do you know if the lowest row in Grandstand 24 is A or AA? Thank you in advance. Sorry for the slow reply Wayne. I am not sure, but trying to find out for you! Hi Clay, there is no published seating guide for Canada, sorry. Can we do in and out of the venue in a single day?I have a ticket for saturday and have some important work in the afternoon. so can i leave and then come back again? Hi, sorry we don’t have specific information to answer this question. It should be possible to get a pass-out, but please ask when you have your ticket checked in the morning as you enter. Have a great weekend! Do you recommend attendees buy a lanyard for their tickets? Is there a need to have the ticket always out and available? Hi Willa, you don’t have to purchase a lanyard if you don’t wish. You normally only need to show your ticket when you are entering the track or entering your grandstand area inside. Some people like to buy the official lanyard as a momento, but you could always buy a cheaper one. Enjoy! You can leave and re enter the track, but have to get your ticket scanned when you leave. If you don’t get it scanned at the gate when leaving, you may not get back in. I’ll be getting tickets soon for grandstand 11 and want to get decent seats in this grandstand, but can’t find anywhere to choose my section number. How can I do this, as you’ve mentioned in your article? Hi Simon, the best way to get the seats you want is to call the ticket company directly. That should apply with buying via the circuit itself, or the ticket companies we deal with, who have an allocation of tickets for each grandstand. Good luck and enjoy the race. Hi. Looking at tickets for Montreal 2016 and wondering if there’s a similar ticket to the GA Premium pass that you can get in Melbourne? That pass ticks all the boxes for trackside viewing and easy access to a bar for drinks. Is there anything similar at F1 Montreal? Hello Chris, Im planing to buy 3 days tickets, but I want to attend only during the race. Is there any chance to re – sale the rest of the tickets legally thru a website like stubhub? Hi, I’m flying in from New York and would like to know what time the event starts on Friday and when it finishes on Sunday to book my flight around that, Please advise, thanks! Can you buy general admission on the day of the Friday practice and qualifications for the 2016 Montreal Grand Prix? We are not avid race fans and want to be able to walk around and get a few for the race weekend while we are in town. My father has followed F1 since his childhood. I am taking him to the Canadian GP. However, he has Parkinsons and has trouble walking long distances. Is there an area near the circuit for handicapped parking? Any advice on this one would be great. Hi James, you can find more information here. “Grandstands 21a and 41a are adapted for limited-mobility spectators. Buying a ticket in one of these grandstands also gives you access to nearby parking”. Hope you and your father enjoy the race! I would like to buy 3 tickets for Jun 11 CANADIAN GRAND PRIX. I would like to buy specific sits Grandstand 11 section 1-2 or 3. How can i find tickets for these sections? On the web i have no option to choose from. Please advice in your convenience. Grandstand 1 & 2 are across from the pits. The Pit assignments are based on how the teams finished in the standings last year. For 2018, Grandstand one section one will be in front of Mercedes, section three will be Ferrari, section 5 will be Red Bull…………. I like GS 1 & 2. Bring your binoculars lots of action all day long. If you buy a 3-day ticket for say Grandstand 24, is that the only grandstand you can sit in all weekend? Or can you sit in other grandstands on the Friday/Saturday with your seat being reserved in Grandstand 24 for the Sunday (like at other circuits)? No, in Canada you can only sit in your allocated grandstand. They do not do roaming like other circuits. hello, I am looking to buy 4 tickets for 3 days, is it guaranteed that the seta will be next to one another? as it says only the Grandtstand number and section 1,2,3…. Hi Diana, if you buy the 4 tickets in one transaction, they will be together. To be sure, leave a comment when you purchase to confirm this. Hi. Do the grandstands have assigned seats, or is it open seating? I am looking for grandstand 11 and 12 for the weekend. At the moment, your recommendation (low rows in 11 and high rows in 12) is currently sold out. From what is available, do you recommend the high rows (5,6,7) in Section 11 or the low rows (1,2,3,4) in section 12? High rows are generally a better bet, as you can see (and take photos) over the catch fencing. Does anyone know what the top row is for Grandstand 1, section 5?